Native calendar entries from your device's calendar can be displayed as sidebar in the My Day Panel (starting today for the next days) or in the integrated calendar feature next to your scheduled tasks (based on Next Review date). I did not allow Calendar and Reminders access on Startup. What now? iOS: Settings > Privacy > Calendars and Settings > Privacy Reminders have to be activated both for Calendar Access to work correctly. Restart our app (worst case your device) to activate the changes. macOS: System Settings > Security & Privacy > Calendars and System Settings > Security & Privacy > Reminders have to be activated both for Calendar Access to work correctly. Restart our app to activate the changes. Android: Download from Google Play store only works if you already accept access in the Play Store. No extra activation is available/necessary within the device. Windows (Classic from our Web Site with Microsoft Office): On Startup Outlook is asking you to allow access. On restart of our App you are asked again (or after a pre-defined time, depending on your companies security settings for Outlook). Windows (UWP from Microsoft Store): Settings > Privacy > Calendar has to be activated for Calendar Access to work correctly. Restart our app to activate the changes. Please make sure you already started our app once to make the Privacy request to your OS. After that please search for the exact app name you used for the installation (Taskfabric, Organize:Pro, Organize:Me). If you activated Calendar Integration on startup of the app, and did not deactivate it in the meantime, you can skip this step. 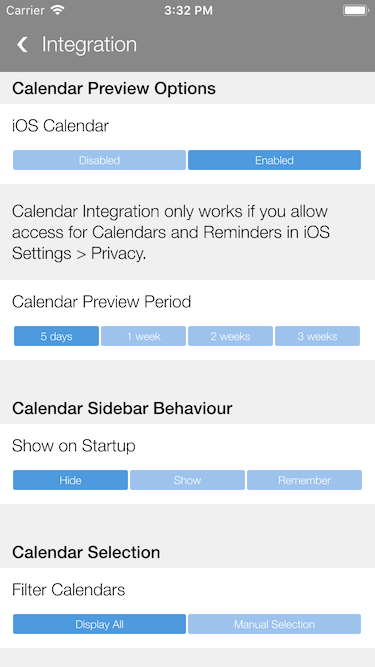 You can enable or temporarily disable Calendar Integration from our app's Settings > Integration > Calendar Preview Options. Enable the settings and choose how far into the future the My Day Panel displays system calendar entries. By default all available system calendars are displayed. If you don't want to include non-relevant calendars (like the Holidays calendar), open from our app's Settings > Integration and choose "Manual Selection" in the "Calendar Selection" section. This displays a list of all calendars found on your system. Now click the blue square on the left side to activate each calendar you want to see. By default all calendars are deactivated if you enable "Manual Selection" for the first time.